Cardiometabolic disorder (CMD) is a cluster of diseases, including cardiovascular diseases (CVDs), metabolic syndrome (MS) and diabetes mellitus (DM). Cardiometabolic disorders (CMDs) remain the principal cause of death in both developed and developing countries, accounting for nearly 32% of all deaths worldwide per year. In addition, dyslipidemia, angina, arrhythmia, cardiac failure, myocardial infarction (MI), and diabetes mellitus represent the leading killer with an estimated 19 million people died from CMDs in 2012. By 2030 more than 23 million people will die annually from CVDs. Existing drugs are not efficient enough to reduce the disease burden as well as mortality. Therefore, there is an urgent demand for new drugs in this area to reduce the mortality and control the associated disability. 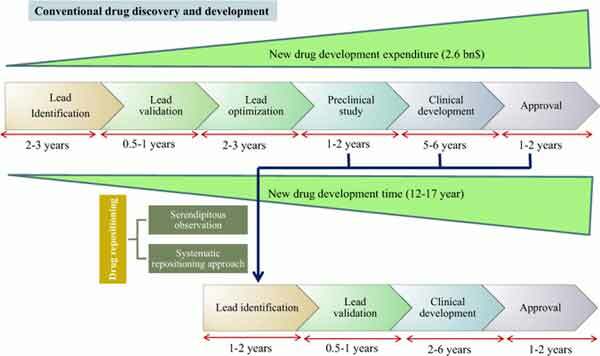 Nonetheless, new drug discovery (NDD) in CMDs has become more challenging for last couple of decades due to increased expenses and decreased success rate. In such a scenario, drug repositioning in the CMDs appears promising for introducing existing drugs for new therapeutic indication. Repositioning is quite an old strategy dating back to 1960s and mainly followed by serendipitous observations during clinical use of drugs. A major advantage of repositioning is that the safety profile of the drug is well established thus reducing the chances of failure due to adverse toxic effects. In addition, repositioning requires less time and investment than NDD. Considering these facts, pharmaceutical companies are now becoming increasingly interested in drug repositioning. In this follow-up, we have talked about the concept of repositioning with important examples of repositioned drugs in cardiometabolic disorder. Cardiometabolic disorders, Cardiovascular disease, Diabetes mellitus, Drug development, Drug discovery, Repositioning. Drug Discovery Research Center (DDRC), Translational Health Science and Technology Institute (THSTI), Faridabad, Haryana, 121001, India.